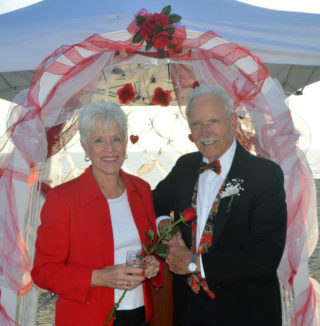 “The popular and romantic Say I Do Again wedding vow renewal ceremony” will be held once again on Valentine’s Day — Feb. 14 — on Siesta and Venice beaches, Sarasota County has announced. This non-denominational service will be performed at Siesta Beach by 12th Judicial Circuit Court Judge Debra Johnes Riva and, at Venice Beach, by 12th Judicial Circuit Court Judge Kimberly C. Bonner, a county news release says. Both events will begin promptly at 6 p.m., but couples are encouraged to arrive as early at 5 p.m., to check-in and enjoy music on the beach, the release notes. Preregistration is required by Feb. 10; the fee of $10 per couple covers the expense of a certificate, a gift reflecting the event, a flower and light refreshments, the release adds. Siesta Beach is located at 948 Beach Road on Siesta Key, and Venice Beach is located at 101 The Esplanade in Venice. To register for the event, or learn more details about it, call the Sarasota County Contact Center at 861-5000 or visit www.scgov.net.